At the fair everyone had the chance to pay £1 for 2 strips of duct tape. 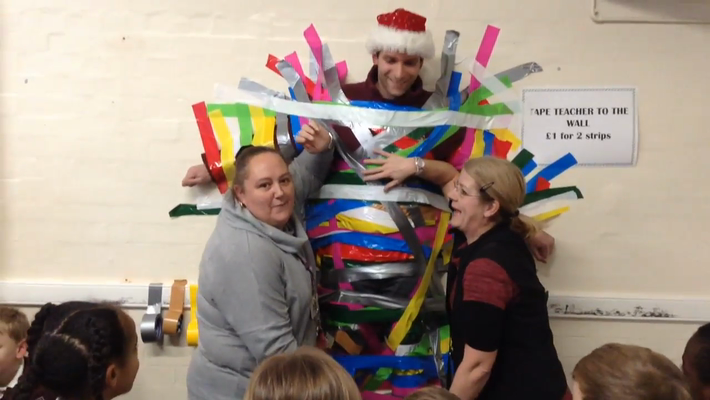 We then used them to stick Mr McNulty to the wall! He started by standing on a chair ..... Watch to see what happens when we took the chair away. Did he stay up? Elfrida Winter Fair, 8th Dec.
Want to play in a lego brick pit? Build and race cars? In a first ever festive special, BRICKLIVE Christmas offers the ultimate LEGO® experience for the entire family. From LEGO® Christmas decorations to a dedicated Star Wars Zone, the show is a must-visit for fans of all ages. Explore four themed zones from Christmas and Creative zones, through to Minecraft and Galactic adventures, each zone will provide a different brick-based, interactive activity for fans to build their dream creations. You can try a free taster session by downloading the complimentary session voucher (valid for 6 months). WIN 2 Free Clay sessions at Aye Create Open studio. 3 X 20% off Kids Shoes at Emmanuelle Marshalls Children's Shoes. This small family business based between Sydenham/ Forest Hill specialises in children’s shoes. A measuring service is provided and they have a variety of shoes for children who have sensitive feet, weak ankles, drop arches (orthotics) splints (cerebral palsy) high insteps, wide/ narrow feet. They also fit first shoes for new walkers and school shoes. Average costs between £20-£40. (235 Dartmouth Road London SE26 4QY, Monday to Saturday 10am-5pm). 4 x WIN Free session of Fitness for Mummies. Visit the Pick-A Prize stall at Winter Fair, buy a strip of tickets and choose which prize draws you want to enter. 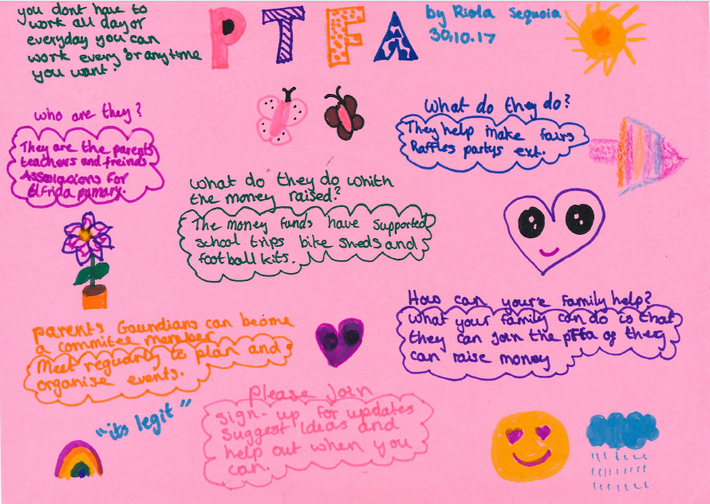 Well done to Riola from Sequoia class who designed the winning leaflet to advertise the PTFA. Please read it carefully to see where you can help! Our PTFA is led by an enthusiastic band of parents who are supported by our Head of School, Elizabeth Newton and our Deputy Head, Karen Cartwright. On Monday October 10th, the PTFA held a coffee morning to support McMillan cancer care and to meet more parents who may be able to help with school fundraising. The event was a great success! Phone numbers were swapped, ideas discussed and a lot of cake and coffee consumed! Thank you to everyone who helped to make this event a success and to the parents who came along and showed their support. If you couldn't make the event but want to be involved with the PTFA please either e mail the address above or leave your name and number at the school office. Last academic year, the PTFA worked really hard to organise a range of events for the children. They organised two whole school fairs, one at Christmas and one in the summer. They also held an Easter raffle and organised 2 exciting Christmas Discos. As ever we need more parents to help out. Please speak to Iyare (who has children in both Walnut and Redwood classes) Michelle (who has a daughter in Pine class) or Clare (whose daughter is in Sycamore class) if you would like to help.